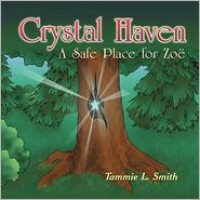 Crystal Haven: A Safe Place for Zo? I truly enjoyed this story. A young girl sets out to discover why her mother had to leave. Starting in beautiful Ireland, the story is an adventure where magic is real and new companions wait around each undiscovered area. I hope the sequel comes out soon. I think this book is appropriate for younger audiences as well. There is a classic adventure/magic feel going on here, but set in a realistic location, like the initial stages of Harry Potter. Nicely Done Tammie Smith!